do you like lee min ho behaviour in his real life or in his drama life? 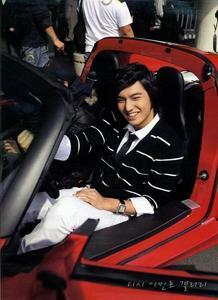 Do you like Lee Min Ho? I would like info on USA fã club please. During a recent interview, actor Lee Min Ho compared his real personality to the characters he played in 'Heirs' and in the upcoming movie 'Gangnam 1970'. The actor revealed that his personality is much closer to the rough-rider character in 'Gangnam 1970' than the soft and romantic Kim Tan from 'Heirs'. He said, "I am completely different than the character that I played in 'Heirs'. My real personality is mais like the one in 'Gangnam 1970'. It's gotten better now, but I used to get goosebumps when I would have to do romantic or proposal scenes." #Lee Min Ho and Aum Patcharapa(Actress Thailand) 's commercial for 12plus chuveiro cream also released and airing in Thailand. *You can find the video on youtube. 1.Lee Min Ho has been choosen as a '4th generation honarary prosecutor' recently along with Moon Chae won(princess man) por the supreme prosecutor office.He will be promoting the prosecutor's office for a whole year!! Lee Min Ho is a South Korean actor who is best known for his leading role as the leader of F4, Goo Joon Pyo, in the Korean adaptation of the popular mangá series, Hana Yori Dango, titled Boys Before Flowers, in 2009.
a question foi adicionado: I would like info on USA fan club please. who is lee min ho new leading lady in his new upcoming drama?